This is my personal story of my prayer life as a Mother and the power that is in believing in God’s promises. This is the story of the day I heard Angels sing. My son Wesley has had multiple health issues for the majority of his life. One of those health problems has been a handicap in his right foot. Long story short, the muscles in his foot and leg did not function properly. Some muscles were over working causing other muscles to basically not develop. All these factors lead to discomfort and pain when Wesley was on his feet for any length of time. This included grocery shopping, zoo trips, playing outside, riding bike, pretty much anything that required him to be on his feet. We had already had one unsuccessful surgery at Vanderbilt Children’s Hospital when Wes was a little under the age of three. I was broken hearted that my son was still in pain, and he was broken hearted that he still couldn't wear cowboy boots. The unsuccessful surgery was at no fault of the hospital or the doctors. We knew going into the surgery that it was all going to be highly educated guess work. There was no case on record quite like Wesley’s, so figuring out a solution was not as easy as referencing medical text books or phoning doctors with similar cases. One thing that made his case so different is the inability for doctors to pin point why the muscles didn’t work. All that being said, after the first surgery I remember thinking this is not the end....This is not what God has planned for my little boy. So, I continued the daily and multiple prayers for my son's healing (1 Thessalonians 5: 17, 18). I refused to believe he was going to walk around the rest of his life in pain. After almost 2 years of praying, we felt God leading us in the direction to find a new Doctor for Wesley, and I knew that there was one Doctor out there that God would gift with the wisdom to make my son pain free. This is about the point where I began saying, "I will just know the right Doctor that God has for us comes along". I said it would be as if hear the Angels sing to me from Heaven. So I would patiently wait for that moment of peace during all these trials (James 1: 2-8). We started the journey with a trip back to our home town of Livingston TN to visit a Doctor that has been looking after our families for several generations now. He gave us a couple of referrals. One of those referrals was to the Children’s Shriner’s Hospital in KY. My hopes were high. So we filled out tons of paper work, gathered all Wesley’s medical records, and said many thank you's to our Shriner's Sponsors. Now we just had to wait to see if Wesley would get accepted to be seen at the hospital. I literally jumped for joy when we got the phone call for the appointment. So off to Kentucky we went. I had been faithfully praying, and I knew that there were so many others praying faithfully with us. I just knew this was going to be it. I just knew that on this day the angels would sing. We meet with the Shriner’s doctors and staff. The whole staff was so very kind to us the whole day we were there, but they felt like the answer to Wesley’s problem was to leave it alone. At best, maybe he would grow out of it, and the muscle would begin to develop. My heart sank. I admit I was frustrated, heartbroken, and just emotionally drained by this point. I remember crying a little as we walked back to the car for the journey back to Nashville. A couple months later we were off to our second referral. We went to a small town called Ringgold, GA to meet with a doctor who is based out of Atlanta GA. Ringgold is about 30 minutes outside Chattanooga. So we decided to stay all night the night before the 9am appointment. We swam in the indoor pool, Wes jumped on the big bed, and we ordered pancakes for breakfast. Wesley thought the whole hotel adventure was just grand. I think it’s the first time he remembered staying in a hotel. At 9 am the next morning Doctor Camasta walked into our lives and folks I heard the Angels sing (an amazing sense of total peace came over me). Dr. Camasta examined Wesley and looked up at us with total confidence and said I think we can fix this, and smiled this unforgettable sincere smile at me that I will never forget. I felt a sigh of relief escape my body as if I had been piled with a thousand pounds of extra weight that was now gone. I felt God at work and my prayers beginning to be answered. It was an overwhelming and humbling experience. I felt like I was glowing with love. I wanted to just tackle Dr. Camasta with a giant bear hug, and tell him how long I had prayed for him. Instead I decided to remain calm and shook his hand and said thank you so very much. Stephen and I both left the office smiling. I had always known that God loved me and would take care of me. I believed that with all my heart, and today I felt that love. It was a deep love. It was a never ending love. God had answered my prayers and it was beautiful. On November 4th, 2009 Dr. Camasta performed the 3 hour surgery to remove one muscle, and clip three others in Wesley’s foot. He also extended his Achilles heel. The recovery was a painful process. It was hard to explain to my four year old that this was God’s plan. You will see you are going to be so much better soon. 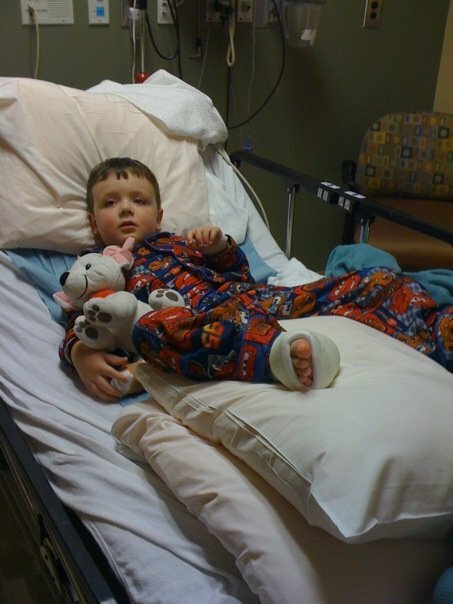 We had many sleepless nights, and Wesley was in a cast, moving around very little. If you know Wesley you know that moving around very little is just not him. He is very spirited and always on the go. About 3 weeks after surgery Wesley began to walk on his knees around the house. This was a pitiful sight to see, but it did not seem to bother him. Don’t get me wrong, I am totally not perfect. I would often lose my focus on God, and try to go through days without Him, and let me just say those where some miserable days for me. I needed God to give me the strength to get me and my family through this, and I knew he would. God loves me. He loves Wesley, and He answered my prayer. My son Wesley while he still walks with a limp, and this journey is far from over he has now been pain free for year this November!!!!!! Wesley riding a Bike this is a big deal for us!!! Beautiful! I am so glad you posted this. I am also glad Wesley is no longer in pain. Thanks for posting this. God's awesome! So glad you found the wonderful doctor who did Wesley's surgery. Glad Wesley has recovered so well! A mother's prayers are special to God. oh Jamie! Phil 1:6 says that "He who began a good work in you will carry it on to completion..." I pray there is a day "hearing the angels sing" is more than just a peace but a confirmation of His promises being fulfilled, so that you know that Wes' healing is finished! LET THE ANGELS SING A LOUD SONG!! !